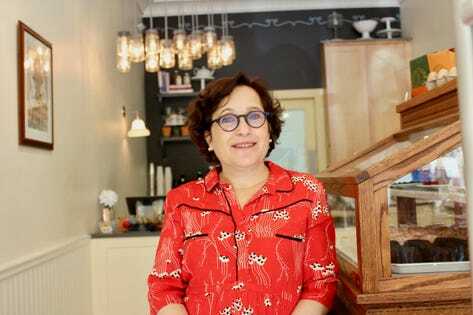 As a girl, Helene Godin never had an Easy Bake oven, nor did this register as a deprivation. She’d be the last one to anticipate that one day she’d be creating the dominant chain of gluten-free bakeries in the Northeast, which is what her By the Way Bakery has quickly become, growing to four retail locations (three in around New York City plus one in Greenwich, Connecticut) since 2011 and finding its way into 47 Whole Foods Markets and counting. It only took four days of post-lawyering retirement for Helene to find herself, she tells me, “bored out of my skull.” In an attempt to keep her sanity, this non-domestic goddess signed up for one of the only enrichment classes–“why not? I was bored”–she could find locally, which turned out to be “Vegan Baking Bootcamp.” She also took her first leisurely visit to a supermarket in years (“I hadn’t done more than dash in and back out in years, practically with the engine running”), a trip that set her business antennae tingling; gluten-free products were getting what struck her as an inordinate –or, she started to think, ordinate–amount of shelf space in her local grocery. “I sensed an opportunity, something that could mesh with my desire to do something non-corporate and non-lawyerly that could be pulled off right in the adorable little town where I live”–Hastings-on-Hudson, NY, which, it pained her to realize, she had barely had a chance to see during daylight hours. 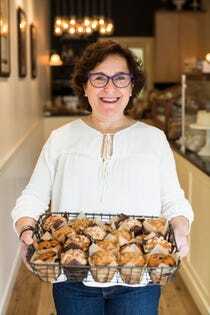 Godin insisted on building her bakery from scratch rather than taking what might have been a more typical retirement-business approach for someone with a few bucks in the bank and solid credit to boot: buying an already operational business. As she had been on the recipes, she was hands-on in every other aspect as well. Though she engaged outside designers for store design and logo creation, she worked shoulder-to-shoulder with them on both. She was completely without a plan for making this happen, beyond counting on her energy and persistence to get her in. “I didn’t know how these things worked; I just literally would pack up my stuff and bring them to the two Whole Foods stores nearest me hoping to run into the right person. And, in fact, one day I did, because if you give anything enough time, it can work. This equilibrium collapsed in late 2014 when Helene got a call from Jay Jay, a Whole Foods employee who was working on the opening of a new Whole Foods on the Upper East Side of Manhattan. With great fanfare, he told Helene that By the Way had been selected to supply baked goods for the “grab & go” of that new store, which Whole Foods’ calculations predicted would be one of the busiest in the country. This invitation proved transformational. Not only did orders from the new Upper East Side store pour in, By the Way products soon found their way into all of Whole Foods’ Manhattan locations by fall of 2016, then expanded outward in the tri-state area (New York, New Jersey, and Connecticut) area. With the Subaru obviously insufficient to handle deliveries, By the Way signed with a distributor in late 2018, allowing them to have their products in all 47 stores in Whole Foods’ Northeast Region.